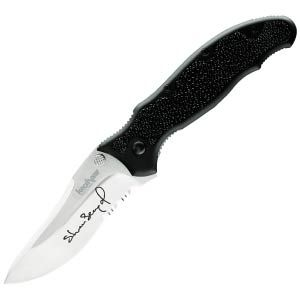 Kershaw’s “Steven Seagal” knife is a big, handsome knife specifically created to fit Mr. Seagal’s hand. The blade features his signature in English on one side and in Japanese characters on the other. The knife handle includes a genuine stingray leather insert. Because of its beauty and durability, stingray leather has been used for centuries to enhance a wide array of products. It is most well known, however, for its use on Japanese sword handles. This is the tradition Seagal had in mind when specified stingray leather for the handle of the knife that bears his name. In addition, the uniquely textured stingray leather provides a one-of-a-kind look and feel-plus additional gripping power. This high style, high performance folding knife combines some of Ken Onion’s signature design features along with the size, looks, and function Seagal demanded. The Steven Seagal knife also features a high-quality AUS8A stainless steel blade with a Rockwell hardness rating of 55-57. Naturally, the blade is honed to Kershaw’s famous, incredibly sharp edge. The anodized aluminum handle is built to be both strong and lightweight, while the stingray leather insert provides a singular look. The handle also includes a removable or reversible pocket clip.